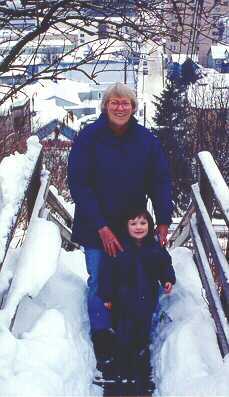 occupies the top floor of her small, two story house that is located high on Starr hill above Juneau. While Munoz finds much to paint in and around Juneau, the majority of her material comes from visits to far flung corners of Alaska. She loves to go on sketching trips to small fishing villages when there's a lot going on. Last June she went to the Sportsman's Cove Lodge on Prince of Wales Island. Rie Munoz is fond of remote Eskimo villages, children at play and animals, usually dogs. Eskimo legends are also popular subject matters for her paintings. 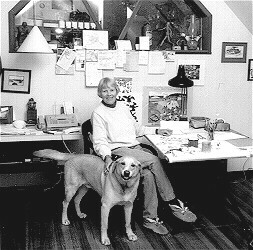 Rie Munoz spends a few months every year in her cabin on Orcas Island in Washington State, as well as time in her cabin in Tenakee Springs, Alaska--a subject of many of her paintings. Munoz prefers her small one room cabins over more luxurious accommodations. Home life in Juneau for Rie Munoz usually starts with coffee at 6 or 7 a.m. followed by a dog walk with Muncie, her yellow lab. Rie likes to paint in the morning for 4 hours or so and then have lunch. 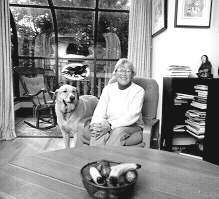 The rest of the day she spends taking care of other matters such as shopping at the grocery store, playing with Mercedes (her granddaughter), signing her limited editions, doing a tapestry macquette, more dog walks, or just plain 'goofing off'. Rie's only son, Juan, is owner and manager of Rie Munoz, Ltd., which is an Alaskan corporation. 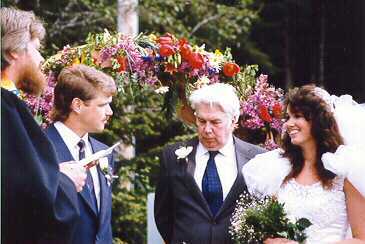 He married Cathy Engstrom in Tenakee Springs on May 19,1990. 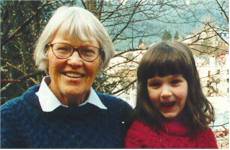 Their daughter, Mercedes, was born in Juneau, at home--which is up 120 stairs--on January 26, 1992. Cathy runs a gift shop called Ad Lib Gifts in downtown Juneau and she is a member of Juneau's city assembly. Mercedes, now 8, is attending third grade at a local charter school her mom helped found. Rie enjoys going to Europe once every year or two, usually related to the business side of art. She likes traveling to London to do a silk-screen or Aubusson, France to inspect a weaving of a Munoz tapestry. 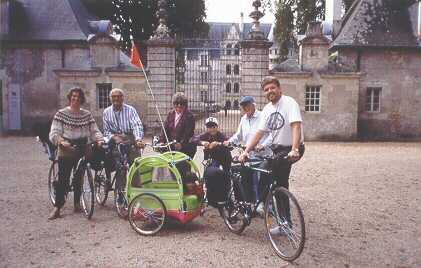 A few years ago she enjoyed a 10 day bicycle trip with friends and family in the Chateau region of France. They stayed in B&B's at night and would bicycle about 15-25 miles during the day.